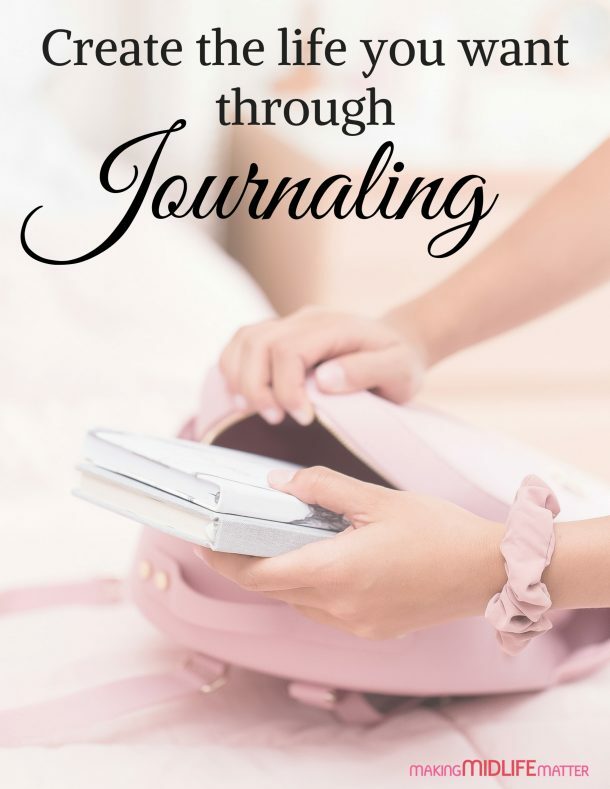 Been busy wrapping, baking, shopping, and cooking? Same here. And drinking more iced coffee than is recommended by 4 out of 5 sleepologists. It was quite a productive week in the kitchen. I baked oodles of cookies (with help from my elves – Grumpy, Sneezy, and Sporty), and I even made a real dinner THREE DAYS IN A ROW! That’s a Christmas miracle right there. The crowned jewel of the week, though, was this absolutely gorgeous kale quinoa pomegranate salad. After being inspired by something similar at a restaurant last month, I knew I had to re-create it at home. We (big, huge congratulatory emphasis on WE) have made this twice this week and it’s been a huge hit. What constitutes a huge hit in this house? Absolutely anytime my most finicky youngest eats bite after bite of a veggie packed dish – that’s what. It turns out pomegranate seeds (aka arils) are the key. I wish I could show you a video of her and her brother fighting over the bowlful of arils while I chopped the veggies. The slightly sweet balsamic dressing didn’t hurt either – she is crazy about this cinnamon pear balsamic we have from the Olive Cart. I think my most favorite thing about this salad, though, is that it stands up to the dressing even the next day. While I can barely choke down leftover Caesar with its soggy, limp romaine, the baby kale here can handle the dressing no problem. Leftover kale, quinoa, and pomegranate salad? Yes, please, for breakfast, lunch, and dinner – just for today. I’m exhausted from all this excitement. 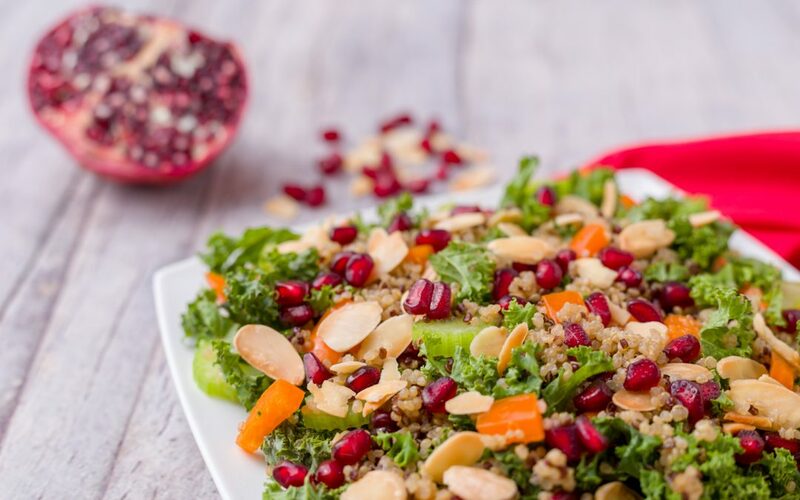 A Christmas-inspired salad, full of the super green, kale, pomegranate and almonds. Top it off with a beautiful balsamic dressing and you have a healthy festive meal for all to enjoy! In a small saucepan, bring the water and a dash of salt to a boil. Add the quinoa, stir, and cover. Lower heat to a simmer, cooking until all the water is absorbed – about 12 minutes. In a salad bowl, toss the kale, celery, parsley and quinoa together. Gently fold in most of the pomegranate arils. along with the dressing. Sprinkle a few pomegranate arils on top to garnish, as well as the almonds, if desired. 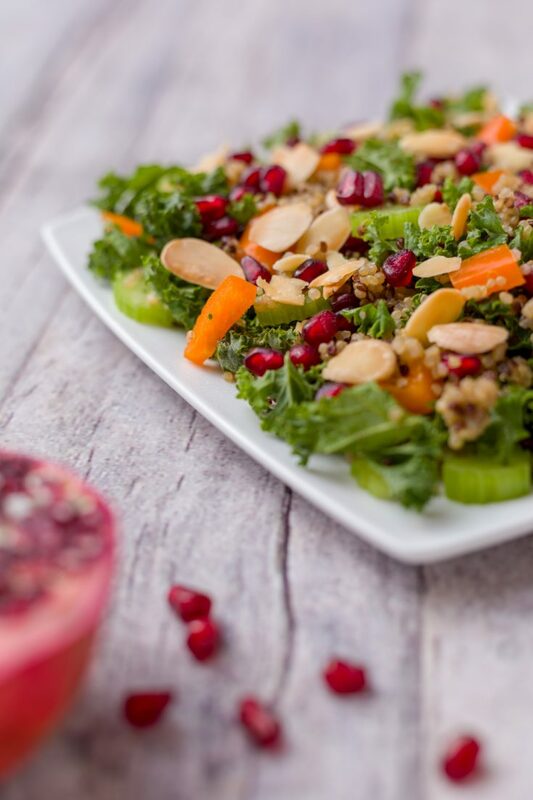 Your kale quinoa pomegranate salad will keep in a covered refrigerated container for 3-4 days. “Feed your family. Keep your sanity. ” Julia is a foodie mom and registered dietitian who’s raised food-loving kids. She can provide the inspiration for you to do the same, with 300+ family-tested recipes, and lots of laughs too at Juggling With Julia.